A passion for training with the foundation and integrity to get it right. Ryan Hoover is Fit to Fight® co-founder and trainer of instructors in eight different countries. 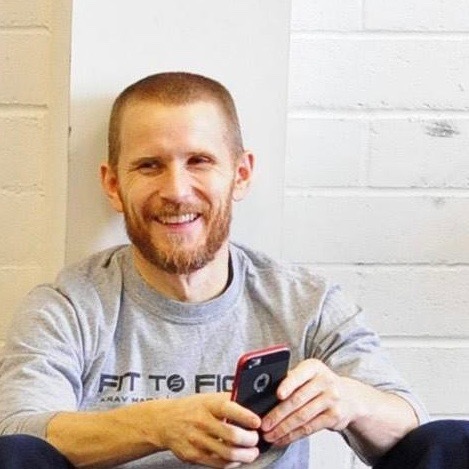 He is the developer of the Fit to Fight® Self-Defense/Krav Maga program. He has co-authored three books on Krav Maga: KM for Beginners, Black Belt KM and KM for Women. Ryan is a certified natural trainer and speed, agility and quickness trainer. Ryan has taught LEO/MIL courses from Denver to Rammstein and all points in between. Ryan is also the co-founder of the self protection program, Hard Ready™, Pride™ kids program, and Safer Campus Now™ active shooter defense program. Ryan is a Krav Maga Force Training instructor, as well as a Krav Maga Train the Trainer. He has been instrumental in developing defensive tactics curricula at the state level. Ryan owns two training centers in North Carolina. Daniel Shaw is a retired US Marine infantryman with multiple combat tours and instructor titles. He has developed curriculum and training standards for pre-deployment training and Marine Security Forces such as the Fleet Anti-terrorism Security Teams (FAST) and the Naval Nuclear Security Program. His direct action experience includes Level IV VBSS and In Extremis Hostage Rescue. Daniel has been a DOD/USMC firearms instructor for over 16 years and the Director of Training at Thunderbird Firearms Academy for 3 years. He holds numerous instructor certifications from the US Marine Corps to include foreign weapons and master instructor of handgun, rifle/carbine, shotgun, and medium to heavy machine guns. Daniel takes his life of training and combat experience and develops curriculum to help responsible armed and unarmed citizens prepare for a deadly force encounter.